(VNRN) – One of the most famous and influential political bloggers in Vietnam, Nguyen Huu Vinh [Nguyễn Hữu Vinh], was arrested at his home in Hanoi on May 5, said the Vietnamese Ministry of Public Security. Vinh, 58, founded and edited the Basam.info blog (originally named Anh Ba Sàm, or Brother Gossiper). He has been accused of “publishing online articles with bad contents and misleading information to lower the prestige and create public distrust of government offices, social organizations and citizens” under Article 258 of the Vietnamese Penal Code. The Investigative Public Security Office said Vinh’s home was searched and he was “urgently arrested”. Also detained was Nguyen Thi Minh Thuy [Nguyễn Thị Minh Thúy], an employee in Vinh’s business. Thuy, 34, is the mother of two small children. Vinh’s web site www.basam.info is one of the most popular alternative sites in Vietnam. He also calls the site “Thong Tan Xa Via He”, or the Sidewalk News Agency, to mock the Vietnam News Agency. Established on September 9, 2007, Anh Ba Sam is a hot “online meeting point” for those concerned about politics. Known as a blog that advocates democracy and freedom for Vietnam under the slogan “Pha vong no le” (“break the chains of slavery”), the site has been regularly hacked and attacked, arguably by both Vietnamese police forces and Chinese hackers. “They are trenchant critics of the regime, for sure, but Anh Ba Sam’s first priority has been to publish an objective summary of newsworthy events in and about Vietnam. It’s up with the news 24/7. As might be expected, the blog has given particular emphasis to the stories that Vietnam’s state-supervised media has been unable to report. 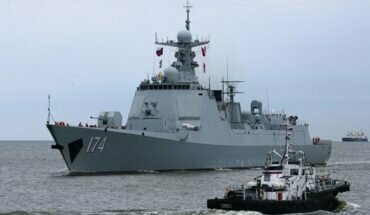 Its daily digest is the hook that has caught the attention of 100,000-plus regular readers,” wrote David Brown, a retired US diplomat with extensive experience in Vietnam, in one of his articles published on the Asia Sentinel in March 2013, when Anh Ba Sam was undergoing one of the many attacks. Vinh himself does not have any personal ax to grind with the government. His father was a member of the Vietnamese Communist Party’s Central Committee, former regional police commander, former Minister of Labor, and former Ambassador to the Soviet Union. 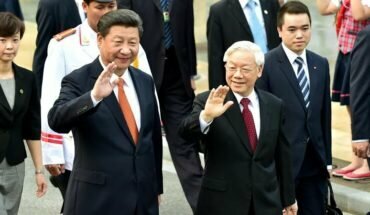 The arrest of Vinh and Thuy came as tension rose anew between Vietnam and China after Beijing moved its first deep-water drilling rig into the disputed South China Sea and prohibited all marine vessels entering into a one mile radius of a Chinese drilling platform established in Vietnamese water. Vinh’s web site has been one of the foremost in calling for taking a stronger stand against Chinese actions. 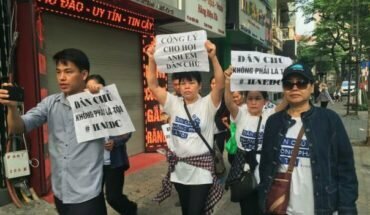 His arrest, under Article 258 raises the bloggers’ suspicion that the Vietnamese government is “yielding submission” to its Chinese counterpart by detaining a famous “anti communist China” blogger. The Article 258 is described as a crime of “abusing democratic freedoms to infringe upon the interests of the State”. It has frequently been used to imprison bloggers and democracy activists in Vietnam in the recent years.